Help Robin Hood face off against the evil Sheriff of Nottingham in a round of archery to win a sack full of gold and the heart of the beautiful Maid Marian. Click here to play! If you and Robin are successful, you'll find yourself King/Queen of your castle with a nice bundle of riches. Join Robin in shooting arrows at targets for chances to win big money. Robin only appears on reels 1 and 5, but he substitutes for all other symbols excluding the scatters. Most importantly, he doubles all prizes when he appears in a winning combination. Keep an eye on the Sherriff because he's a sneaky character. If you can spin two to five of him, he'll pay off 2500 times your original line bet. The beautiful Maid Marian will also pay out generously. Spin her five times and you'll get 1250 times your line bet. Sacks of gold and bow n' arrows both pay out 750 times your line bet. Hit three or more targets and you will trigger a bonus game that will pay out generously. And five or more castles anywhere on the board will multiply your total bet respectively. Join Robin in a target shooting battle against the Sherriff of Nottingham. If you can beat the Sherriff, you'll leave Sherwood forest with a large sack full of loot. 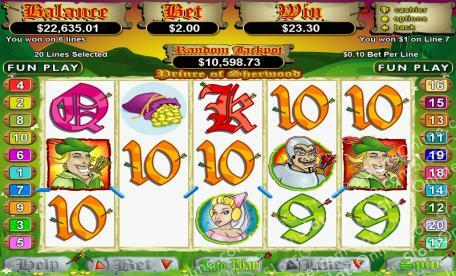 Two or more Castles anywhere on the board will multiply your total bet respectively. Dashing, daring Robin Hood decked out in his green cap and smock will replace all other symbols on the board, excluding the scatters and triggers. He doubles all prizes when he appears in a winning combination. If you spin three or more Archery boards you will trigger a bonus game. The game takes place off the reels. You choose between Robin Hood and the Sherriff to represent yourself in an Archery contest. You player shoots at a target, each ring equaling a certain amount of free games and a multiplier. If your selected archer scores higher than the competing archer, you move on to round two. Your player again shoots two arrows for free games and mulitpliers.